In the 19th century, American industrial development caused millions of immigrants to emigrate from Europe to the United States. Many came to provide labor for the industrial growth of the Northeast and Midwest. A large number of Slavic, Magyar, Baltic, Celtic, and Mediterranean immigrants settled in the nation's growing cities. This immigration wave continued until 1924 when Congress enacted the Johnson-Reed Act, which restricted immigration as a whole, and from Southern and Eastern European countries in particular. Additionally, the onset of the Great Depression in the 1930s acted as a deterrent to further immigration to the United States from Europe. Separated from the ruling class by blood, religion, and economic circumstances, white ethnics retained a strong and distinct sense of identity. During the early 20th century, many white ethnics were relegated to menial or unskilled labor. They were often subject to ethnic discrimination and xenophobia and were lampooned with stereotypes. In contrast to the mostly Protestant Anglo-Saxon majority, white ethnics tend to practice Roman Catholicism, Eastern Orthodox Christianity, Islam, or Judaism. These cultural and religious differences helped them retain a strong and separate identity from the rest of America. In the 1950s and 1960s, suburbanization caused many young ethnics to leave the city and settle in the nation's burgeoning suburbs with the hope of rising into a higher economic class. At the same time, white ethnics became more involved in American political life and began to challenge the Anglo-Saxon ruling class for greater political power and civil rights. 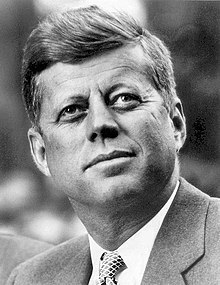 The election of John F. Kennedy as President in 1960 was the first time that a white ethnic (Irish-Catholic) was elected President. However, it was not the first time that a white ethnic was nominated for the Presidency. In the 1960s and 1970s, several ethnic organizations were more vocal in promoting white ethnic culture. ^ Marger, Martin N. (2008). Race and Ethnic Relations: American and Global Perspectives (8 ed.). Cengage Learning. p. 282. ISBN 0-495-50436-X. "Religion is the most critical factor in separating white ethnics in American society. As Catholics and secondarily Jews ... they were immediately set apart from the Protestant majority at the time of their entrance and given a strongly negative reception." ^ Marger, Martin N. (2008). Race and Ethnic Relations: American and Global Perspectives (8 ed.). Cengage Learning. p. 281. ISBN 0-495-50436-X. ^ "Overview of Race and Hispanic Origin: 2010 Census Briefs" (PDF). Census.gov. Retrieved 19 August 2017. ^ name="Pacyga1997"> Pacyga, Dominic A. (May 1997). "Catholics, Race, and the American City". H-Net Reviews. Retrieved 16 December 2009. ^ Chan, Sewell (25 October 2007). "White Ethnic Politics: Irish and Italian Catholics and Jews, Oh, My!". The New York Times. Retrieved 8 June 2016. ^ Byrne, Julie. "Roman Catholics and Immigration in Nineteenth-Century America". National Humanities Center. Retrieved 13 July 2016. ^ "AN ANTI-CATHOLIC LAW'S TROUBLING LEGACY". Catholic League. Retrieved 13 July 2016. ^ Greeley, Andrew (1 July 1971). "Why Can't They Be Like Us: America's White Ethnic Groups". Commentary. Retrieved 1 March 2017. ^ Novak, Michael (1972). The Rise of the Unmeltable Ethnics. New York: Macmillan. ISBN 0-025-90780-8. ^ Greenblatt, Alan. "The End Of WASP-Dominated Politics". npr.org. Retrieved 14 July 2016. This page was last edited on 13 March 2019, at 04:39 (UTC).